Highly detailed kit from Hasegawa of the F-18C Hornet. This kit has some metal and photo-etched parts. 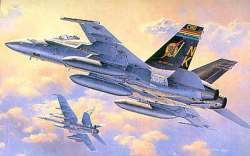 VFA-25 "Fists of the Fleet".